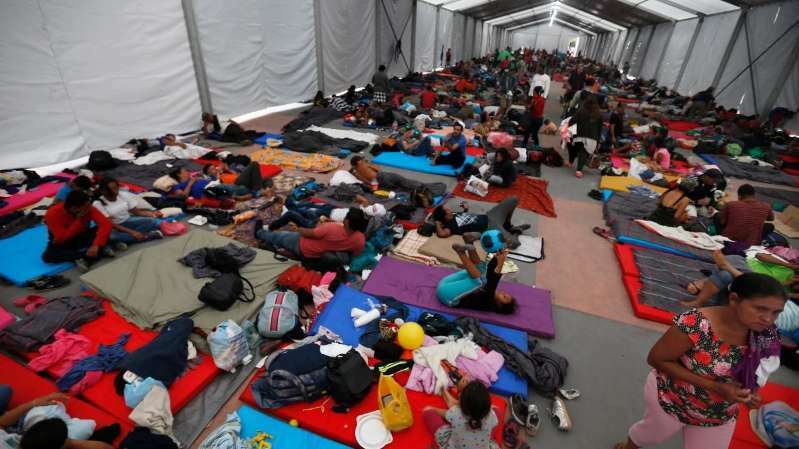 © FoxNews.com Thousands camp out in the city before continuing their journey to the U.S. border; William La Jeunesse reports from Mexico on the progress. The leading migrant caravan pushing its way toward the U.S. border is hunkering down in Mexico City on Tuesday, as Americans head to the polls with the contentious group -- and the equally combustible immigration issue -- on their minds. A Fox News crew traveling with the caravan was told this morning that 4,000 migrants slept last night inside the Jesus Martinez stadium in tents, on bleachers and under tarps -- and another 1,000 are reportedly still en route Tuesday. The caravan – which has become a key talking point for President Trump in the final lead-up to Tuesday’s midterm elections -- is expected to stay in the stadium for a few days. While there, members of the group are receiving advice from Mexican federal officials and Central American embassy workers on topics related to their future, including medical care, work permits and legal matters. Several migrants in the leading caravan told the Associated Press some members were able to reach the country’s capital at a faster pace in recent days. In the town of Veracruz on Sunday, the Fox News crew traveling with the caravan observed two nuns stopping big rigs in order to fill the trailers with waiting migrants. The Catholic nuns were from Guadalajara’s Misioneras de Christo Resuscitado, and, in one instance, as a big red 18-wheeler approached, they flagged down the driver, stepped on the running board on the passenger side and spoke for about 5 minutes. The driver then gave a reluctant wave of the hand, one of the nuns spoke and dozens of young men ran to the rear to open the two tall metal doors. The stadium in Mexico City that the migrants flocked to Monday has a capacity of 6,000, officials said, and four big tents set up for sleeping quickly filled up. Blankets were in high demand as the chill settled in a city more than 7,300 feet above sea level, a big change for the group, which had just trudged for three weeks in tropical heat. Nashieli Ramirez, ombudsman for the local human rights commission, said Mexico City was preparing to accommodate as many as 5,000 people. The 5,000 number is not even half of the 12,000 Central American migrants currently traveling in four caravans inside Mexico on Tuesday.